This week on our podcast ‘The Interval’ we had the absolute pleasure of speaking with Steve Keys, the man behind Rocklite. He speaks about his history in the wood industry, the product itself, and how Rocklite came to be. Steve has been in the wood trade since he left school at 15. At that time he started his apprenticeship, and high-quality woods became the norm. When he moved into the East End of London to manage a number of furniture factories, it became apparent how difficult it was to sustain the quality of these materials, and how rare they were to find. 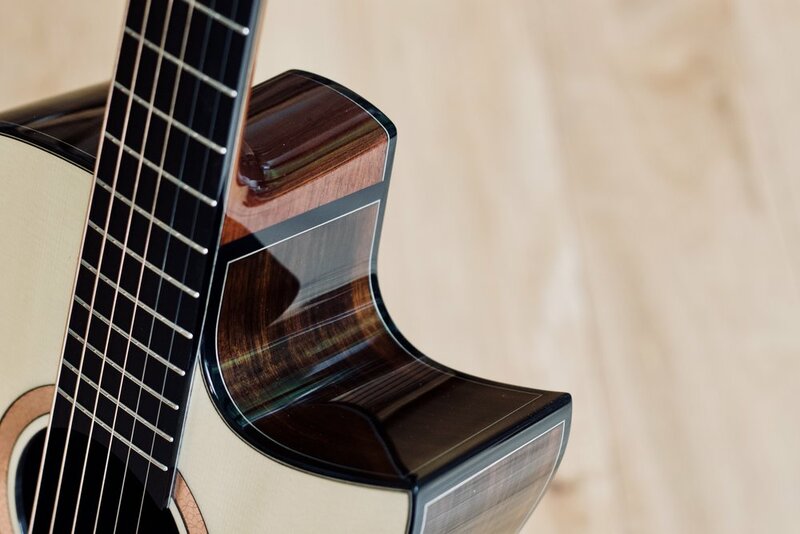 This made him want to change something, and he started experimenting when he found that high quality, quarter sawn and defect-free ebony in particular was becoming almost impossible to source. Steve highlights that what used to happen in the industry was that of all the trees felled only a small proportion were sold because not all were consistently the prized black colour, striated ebony would be left on the forest floor. This wastefulness increases the importance of what Rocklite do. If you’re under the impression that Rocklite doesn’t perform like wood, think again. It is actually made of real wood; specifically, a combination of European Eucalptus and North American Tulipwood and not to be confused with a paper based product bearing a similar name. It’s not a fibreboard; it has a structural integrity that allows you to bend it, plane it and work it like wood, with straight grain. It really is a joy to work with and to the untrained eye, almost indistinguishable from African or Indian ebonies. Steve has also released a substitute to Indian Rosewood, which he calls ‘Rocklite Sundari’. This has grain variation, and looks strikingly similar to real Indian Rosewood, so much so that the lutherie community had an incredibly hard time identifying it as a non-rosewood timber when pictures of Sundari were first circulated on Facebook. When asked, Steve says he has no immediate plans to release any other tonewood substitutes further to the Ebony (Rocklite Ebano) and Indian Rosewood (Rocklite Sundari) , as the quality of the existing products means that demand is already starting to outstrip capacity. Our workshop is always well stocked with a stash of Rocklite, it is our standard material for bindings, fingerboards and head plates, we’ve even experimented with using it for bridges to great effect. It is a responsible and effective solution to the problem of finding high quality ebony and some of the associated ethical concerns (it is unrumoured that all diospyros species are to be placed on CITES appendix 2). It was a pleasure chatting with Steve and having our questions and those posed to us through our Instagram page answered! Listen to the full podcast to hear Steve about Rocklite first hand. Don’t forget to hit the 5 star button if you enjoy it, and leave us a comment if there’s someone you’d like to see us interview!